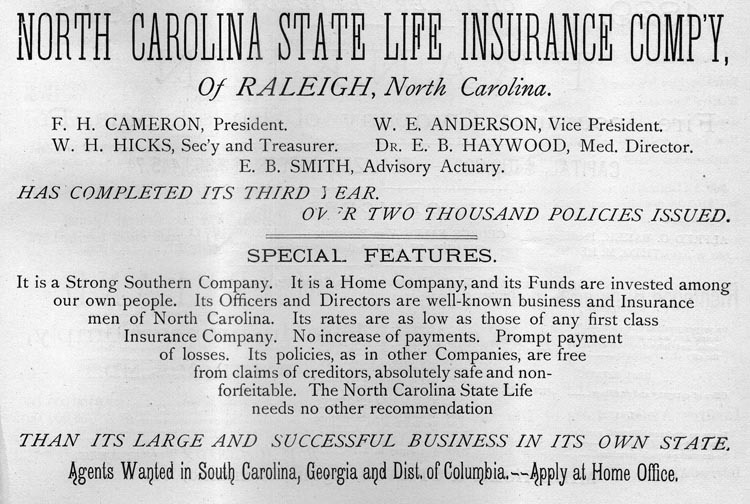 North Carolina State Life Insurance Comp'y, of Raleigh, North Carolina. F. H. CAMERON, President. W. E. ANDERSON, Vice President. W. H. HICK, Sec'y and Treasurer. Dr. E. B. HAYWOOD, Med. Director. E. B. SMITH, Advisory Actuary. It is a Strong Southern Company. It is a Home Company, and its Funds are invested among our own people. Its Officers and Directors are well-known business and Insurance men of North Carolina. Its rates are as low as those of any first class Insurance Company. No increase of payments. Prompt payment of losses. Its policies, as in other Companies, are free from claims of creditors, absolutely safe and nonforfeitable. The North Carolina State Life needs no other recommendation. 1. The Insurance Advocate, Vol. IX, No. 3, Richmond, VA., March, 1878, page 57.